Build your own ski resort and meet the expectations of challenging visitors in the ever-changing world of Snowtopia! 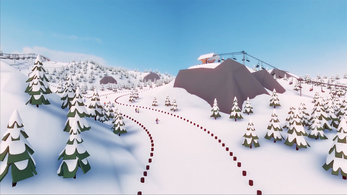 The alpha of Snowtopia is out and yours to play for free. Download it at the bottom of this page!! Suscribe to the newsletter, join us on our Discord server and follow us on Twitter to receive the latest news about the project! 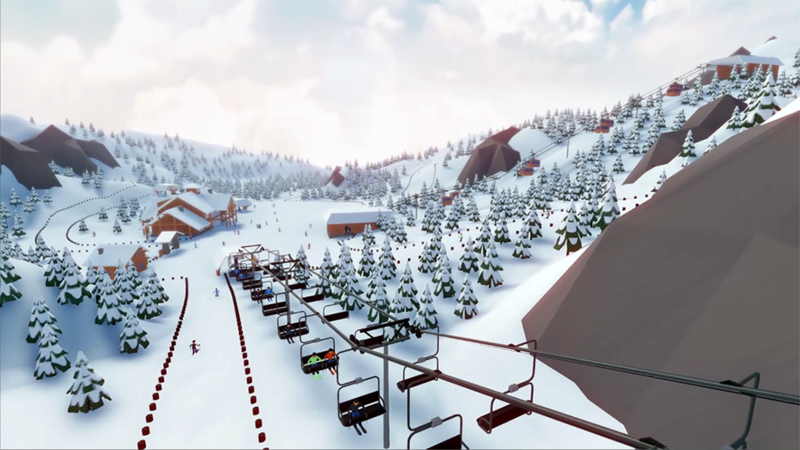 Design ski runs and build cable cars but also improve the resort and manage the workforce to attract ski lovers of all kind. Will you create a charming village or a sprawling network? That’s up to you! In Snowtopia, the proper functioning of your station rely on the well-being of visitors. Choose wisely the ones you want to attract in your station and find a way to keep them happy! Surrounded by stunning landscapes, take a break and enjoy the view. 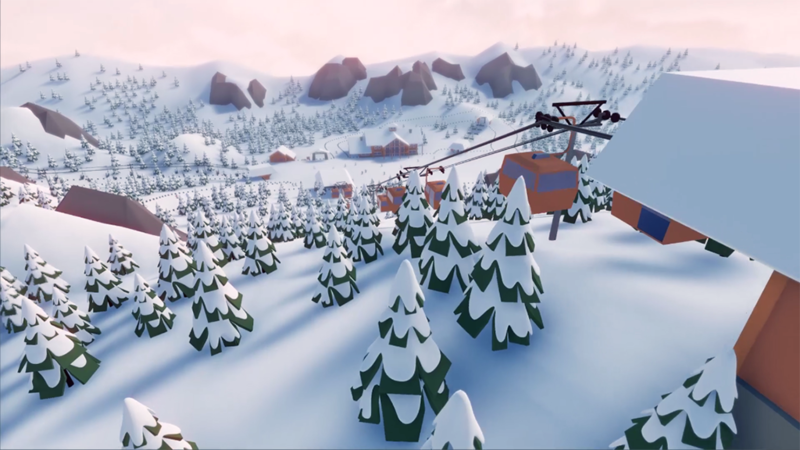 Snowtopia is a feelgood game that immerses you in an atmosphere between wild nature and wintry joy. 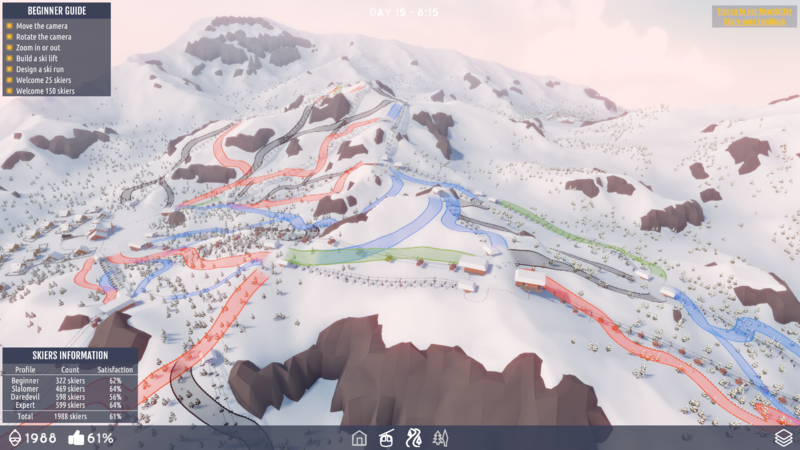 Snowtopia is a ski resort construction game with a hint of strategy and respect for the environment. 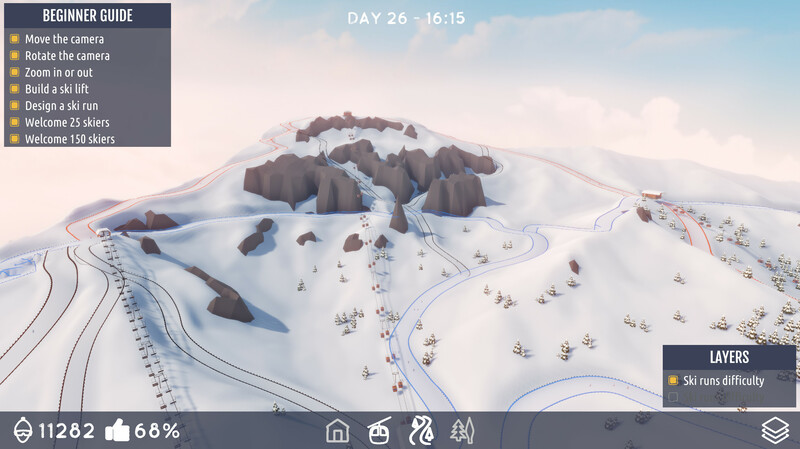 It is intended for ski enthusiasts and tycoon players. Snowtopia is the work of Tea for Two, an independent studio based in Paris, France. 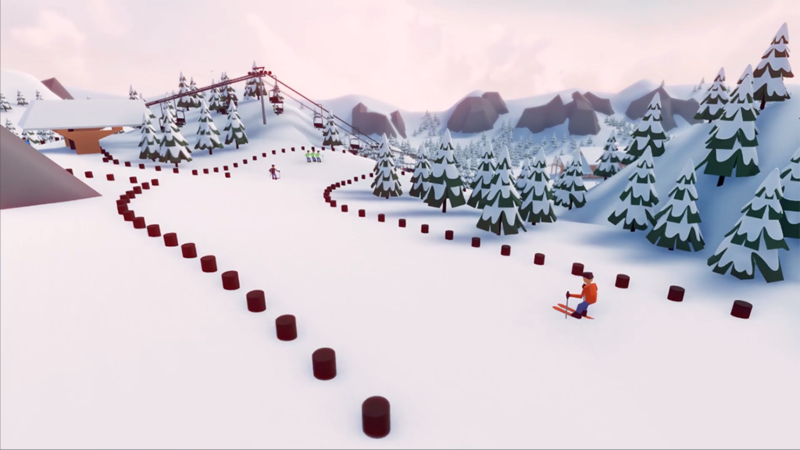 The core team is led by Garry Williams (Programmer, ex-Ubisoft and Electronic Arts) and Anne Lautrou (Producer, ex-educator and sustainable development consultant), both keen skiers – whenever they find the time! – and big fans of tycoon game. They are backed by a solid team of freelancers and by Blueprint, the collective they co-founded in 2016. 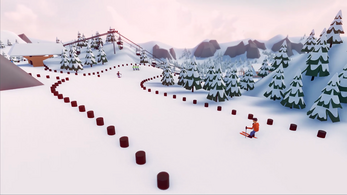 In case you had any question, comment or feedback about Snowtopia, feel free to get in touch with us at contact@teafortwogames.fr or to signup to our newsletter. Please consider remapping the inputs with the Unity launcher, as there it's currently not possible to change input while in the game. The Linux version is currently untested, apologies. How do you play the game! What are the Mac system specs? 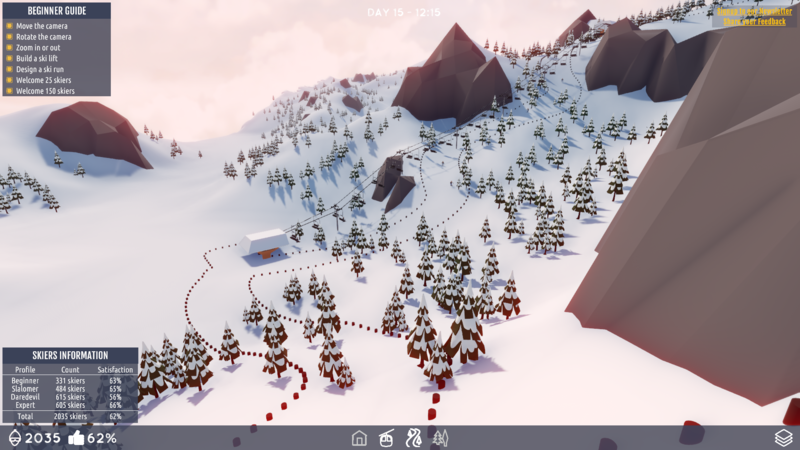 Saw the game on a "notepad compact" made by tom.io on YouTube some weeks ago and finally had a chance to install it on my Linux-Gaming-PC and give it a try. So far, it's running smooth and fine in Full-HD with graphics set to "Ultra". Definitely going to watch that game and looking forward to more content to be added. Looks promising! Keep it up! It's a pity that there are so few games in this genre. I've played a few, which are older than a decade already, and love to see a new game being developed. I just jumped into the alpha to have a quick look, and found myself still playing after 2 hours. 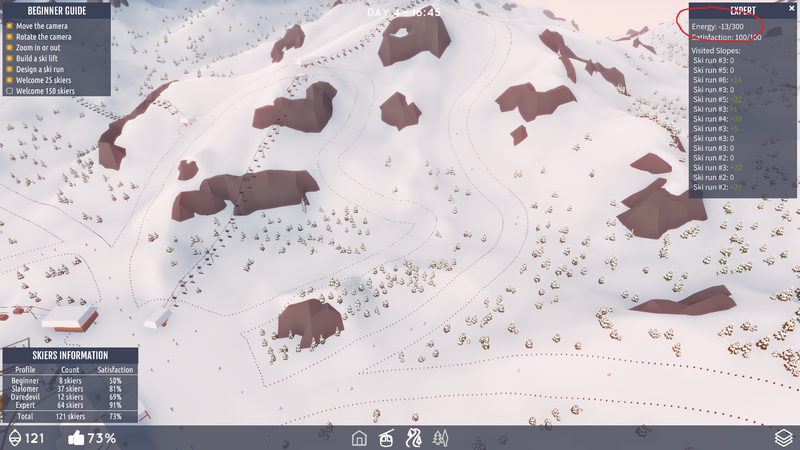 Although there are only limited features at the moment, I instantly fell in love with only creating lifts and slopes. Especially being able to plan the runs to fulfill a certain difficulty makes is so much fun to plan your next steps accordingly, e.g. 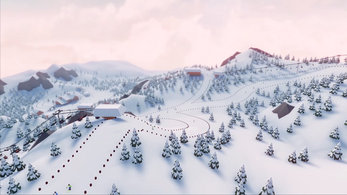 connect the villages and key lifts always by beginner runs and extend the offer by harder difficulty slopes. After playing well over an hour, the game turned more and more laggy and unplayable (and the sound went crazy), with 10k+ guests it's no surprise I guess at this stage of development. Please, continue the work on this awesome game! Can't wait to play it again as soon as a save game option is available. Please! Add a save game function! Please! I love this game but that is really annoying that i cant save my game! Good job! Thanks for this game! So far so good and only minor glitching. I would love to see these things added. I know it is only Alpha and this is just a test of your game but I would like to see it be more tycoon-y. such as lodge management, maintenance, , buying snow machines, rentals etc. Thanks for making this game. It is one of a kind and very unique. I love this game. It's a bit glitchy, but nice. -Trails that should be green are blue, and greens have to almost be flat same goes with should-be blues are reds, etc. Thanks for making the game! You are working hard and I hope the final edition will be much better. After a while i get bored, so please add more! It looks cool but how can you start playing it. What do you mean ? Did you download the game on your PC ? Did you launch it ? Where are you stuck ? Yes I downloaded it but it says "it may be dangerous". THANK YOU IT'S RELLY FUN! Wow. Im interested in game dev too, and seeing something this great is amazing. Please keep up the great work, I really enjoy this game and think the core gameplay is really fun. What an amazing game. I only downloaded Itch yesterday but already I feel like I found a real gem that will only get better as development continues. I'm really looking forward to seeing what happens next. Great job! I simply love the tranquility of this game (at least in the current sandbox mode). It's just so nice when I can't go skiing myself. 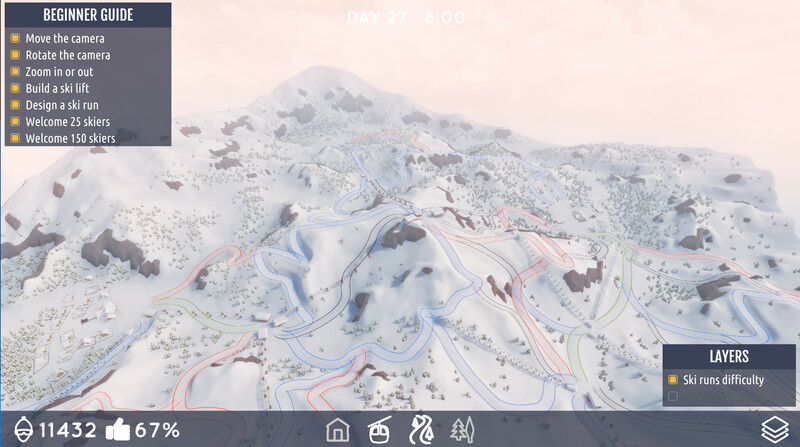 It needs to be easier to select skiers (to view their experiences; maybe there should be some stats on the individual pistes themselves, rather than the skiers?). 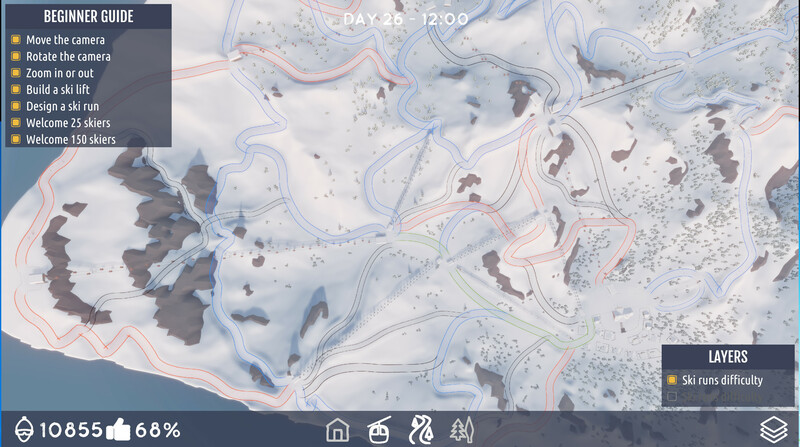 A topographic view of the map (with altitude lines, as used for hiking) would greatly aid planning interesting pistes by avoiding hitting "white bits" after having planned most of one. Also --at least on my slow machine-- the view navigation (rotate, zoom, pan) is much too coarse and continues way after I've stopped giving inputs with the mouse. This means that any movement must be in multiple tiny delicate steps (especially since there isn't yet an effective way to view slope angles). I'm very curious how this will evolve, and will definitely follow along. Keep up the great work! I think that there should be custom maps. You could create a program in which players could post maps or mods. You should also create more maps to choose from. 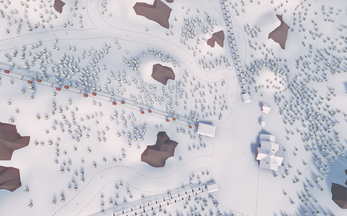 You could model maps after real life ski resorts! For example, Grindelwald, Switzerland Sugarloaf, Maine Vail, Colorado or South Lake Tahoe, California. I know that there is amazing potential for this game! I've been looking for one like this for weeks! - Weather - how does snow conditions, weather conditions etc. effect visitor numbers. Does altitude of runs affect snow quality? Avalanche safety. Do runs and lifts need to be closed due to high avalanche risk or lack of snow. Would be great if each season followed an arch from Autumn through Spring and then it skips the summer. 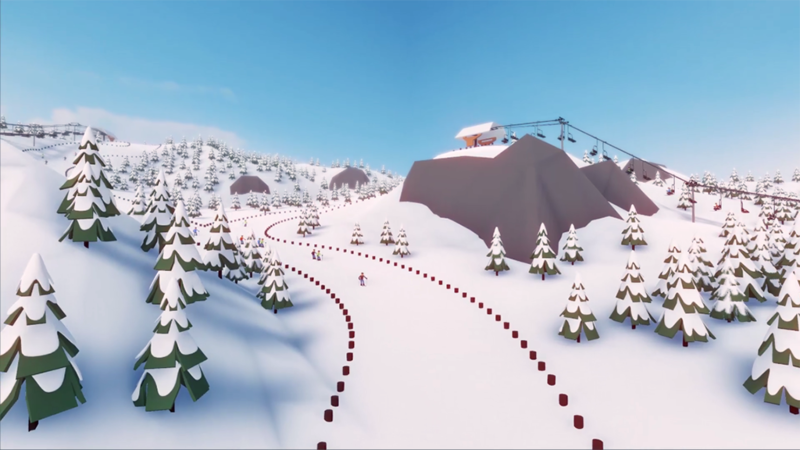 - Trails - this is super common in real ski resorts as a way of opening up a ton of terrain without another lift, never seen this executed in a game. Just wanted to flag a bug. I was playing - laying down new runs. It made the sound effects as if the run was created. 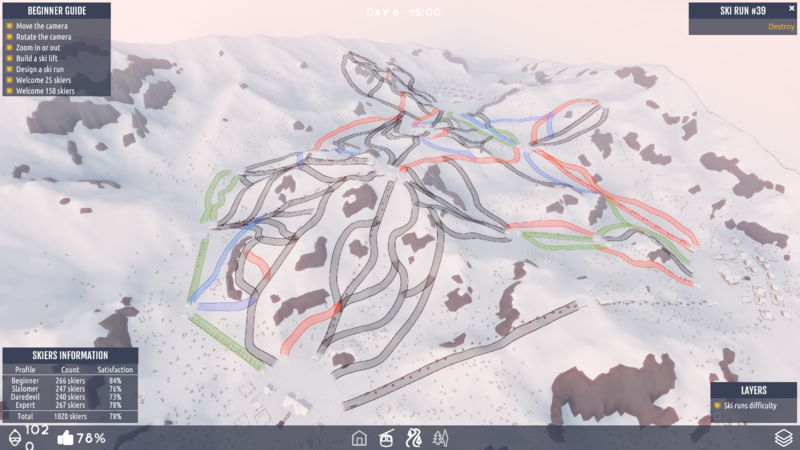 I could create additional new runs/lifts and the visitor counter kept going up but all the lifts and skiers stopped. Then when I created new runs the error continued. See screenshot. Nicest review ever! Thanks :) Yes, we agree with you and are planning to keep the sandbox mode. Hi! Could you share a Screenshot so we can have a look at your issue ? So far, LOVING this game!! It's just great and has SO much potential and the fact the developers are listening to us enhances this entire experience!! Hi! You're the first one to report this issue but we'll definitively keep it in mind. Thanks! One minor issue: The executable in the linux version is called "Swnotopia" instead of "Snowtopia"
I CAN'T GET INTO THIS GAME!!!!!!! Whaaaat...! Why ? I don't know where to start. Tell us what's going on. Oh, sorry about that. I had it downloaded but I didn’t know how to install it. Now I have it all figured out. It’s kind of complicated installing games on PCs. 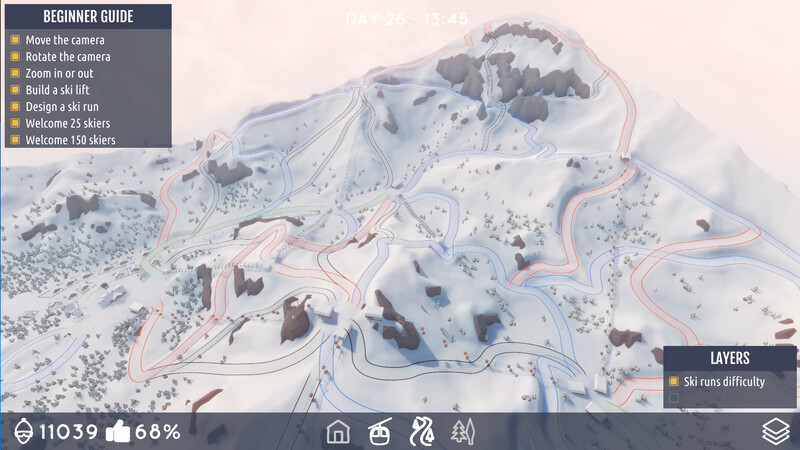 The new version will handle a lot more skiers, and there won't be any more trees on the pistes! Did you figure it out? There have been a new release, built with a new version of Unity, it may be worth giving it a shot. Really loving this game and I've spent a lot of time just following the terrain with the tool. So relaxing and enticingly frustrating trying to figure out how the AI works and how to design around it. I've definitely spent more than enough hours into the game just enjoying it's relaxing nature. Are there more levels available now? I feel like my game once loaded into a different level/map where the mountain(s) were different. If so, is there a way to select load into them? Is that something that is going to be included in the next release? Anyways, great game, really enjoying it at this stage. Can't wait for the Kickstarter to launch. PS, is there any insight you can give off to what sort of runs each skier type wants/likes? The Slalomer is particularly puzzling to me. The next step for us will be to add some management elements, so the satisfaction part should become clearer. From what I remember, Slalomers are good skiers but enjoy easy slopes. So blue is the best for them but red is ok.
That explaines why my ratings are so low from them. I hardly had any blues! All the best with the game! I am also having a download problem, game just refuses to start after extracting files, shame as it looks good. Quick question are you likely to publish this game on "Steam", hopefully so as I'm sure you'll attract a big audience there. WOOHOO! STEAM! WE LOVE STEAM! WE LOVE STEAM! WE LOVE STEAM! You get the point. Right? What is happening ? Did you contact itch.io ? Because I don't think that we can do a lot about the downloading part. Just let us know if you don't find any solution. We'll find a way to send you the alpha. guys you made a dream come true, looking for such a game for years, great thanks. i'm an fanatical ski skier for years now, and i love this game. but in the windows version i can't touch on the house button and tree, and i can't save any game. Hi! There is a lot more content we're planning to add to the game. Hope you enjoyed the alpha so far and see you along the way! I love this game, but I think there are a few important things. - Add a season element to it, the beginning of a ski season and end, add snow storms and different conditions, like avalaches and thin cover, be able to open and close lifts and runs. If you can add a few of these in the future it would be sooooo cool. I love your game so far. Hi! Thanks for playing the game. See you at the next step when there will be more content in it! The mac version won't unzip, it's only 22 bytes. It seems I messed up somewhere while uploading the build. I'm uploading it again, should be up in about 10 minutes! Really fun and beautiful, this game has a lot of potential! The Linux version runs smooth on the lowest settings but the game still looks pretty. Hi! Thanks for passing by :) Always happy to now the game is working fine for you! Hi! sorry it didn't work for you. We're working on the next version of the game. We'll make it better so you can play it. I can't get this to work on Deepin OS, a Debian based Linux distro. Get a blank white screen. Any ideas? try downloading off of playsnowtopia.com if that doesn't work, sorry! Hello, are you on a 32bit or 64bit system? The game is currently built as a 32bit executable, I'll update it to include the 64bit version as well. The best winter tycoon that I ever seen!! I wait from 2002 (there was published a similar game: Ski park manager) and now Tea for two studio published this! In the end, I had the same issues as you when I reached about 3k skiers... It was on the brink of crashing.